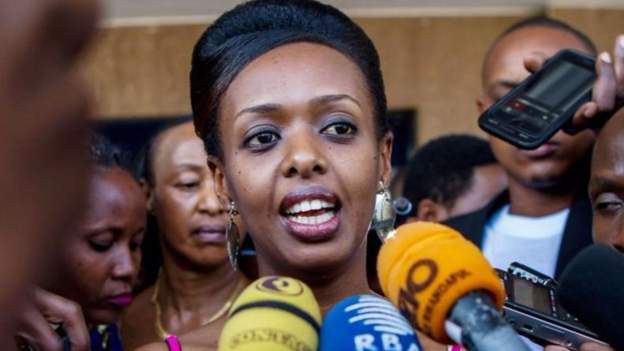 State prosecutors in Rwanda are pushing for a 22-year jail term for activist Diane Shima Rwigara and her mother Adeline Mukangemana. Rwanda’s government is coming under increased pressure to drop charges against one of President Paul Kagame’s critics. Diane and her mother are facing charges of attempt to foment insurrection against the government. Rwigara and her mother were freed on bail after spending a year in prison. They are both also facing charges of forgery, which they have denied. Their sentencing is due this week but a group of US Congress members want the charges dropped. A US Congress member Suzanne Bonamici is quoted by the BBC as saying that “I know that there’s been some progress made in Rwanda economically especially after the horrific genocide. And I know that there are many women in office in Rwanda, which is a positive thing”. “However, we can’t let that mask the political and civil rights violations. And if women are to be serving in office, they must be able to serve in every office, including the presidency and run for the presidency without becoming a political prisoner,” Bonamici further said. President Kagame last month defended his country’s justice system despite criticisms that his political opponents barely get fair court hearings. Mr. Kagame’s political opponents are often prosecuted and jailed. Most victims of such a process say they are not given a fair trail. President Kagame despite criticisms of suppressing political dissents is however credited with overseeing rapid economic development in his country. He has led the country’s transformation after the 1994 genocide. Mr. Kagame last year won a general election to continue to serve another seven-year term.